Has anyone done this rather than in pots or growbags? Did you have any problems, or find it better or worse that the alternatives? I usually grow 3 or 4 in pots in the greenhouse, this year I've grown loads, including some redcurrant tomatoes & have prepared a patch of ground behind the greenhouse - (sunny & sheltered). I'm planning to dig in a couple of extra bags of compost before they go in there, and I'm growing lots of basil to plant around them, which apparently helps with whitefly & makes the toms taste better. I think I'll keep a couple in pots as a backup! kitla wrote: Has anyone done this rather than in pots or growbags? Did you have any problems, or find it better or worse that the alternatives? I usually grow 3 or 4 in pots in the greenhouse, this year I've grown loads, including some redcurrant tomatoes & have prepared a patch of ground behind the greenhouse - (sunny & sheltered). I'm planning to dig in a couple of extra bags of compost before they go in there, and I'm growing lots of basil to plant around them, which apparently helps with whitefly & makes the toms taste better. I think I'll keep a couple in pots as a backup! Interesting, so is blight caused by the conditions or is it left in the soil from other crops? The patch I've prepared is where the compost heap used to be, we've not grown anything there before. My other option is to put them outside but in part buried pots, so I can control their environment a bit. I have plenty of tomato seedlings so can afford to experiment! 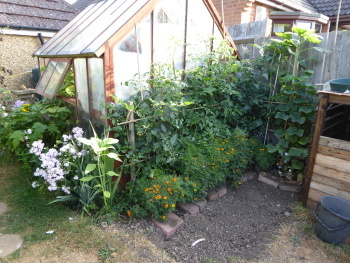 I also have a tray of tagetes growing which is for the tomato bed and the other veg patch - I read somewhere it also suppresses bind weed & potato worm. kitla wrote: Interesting, so is blight caused by the conditions or is it left in the soil from other crops? a bit of both - the spores are in the air and soil all the time but during warm humid conditions (think summer rain - day after day of rain), the spores which land on susceptible plants like tomatoes and potatoes then go on to infect them (there are lots of different types of blight which affect other specific plants but probably more noticeable on crops) When conditions are right, infected plants that have succumbed release spores which can cause widespread devastation in an area. Growing some tomatoes in a greenhouse reduces some of the exposure to spores but they can still become infected during a particular bad case of blight - greenhouses have notoriously high humidity which are ideal conditions for it to spread rapidly. Allotments tend to have high levels of blight as one plot becomes infected, the spores released rapidly affect other plots, so your garden will probably have a slightly lower incident of blight in comparison but is not immune. Farmers keep an eye on conditions and spray their crops so that spores cannot infect the plants. One home spray uses copper sulphate (you can buy it as a spray or powder known as Bordeaux mixture) - from an environmental point of view, copper is very toxic especially to aquatic animals so one of those treatments which should ideally be restricted, but on the other hand is very effective. 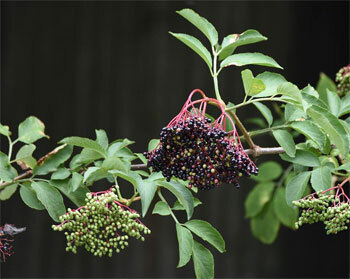 It is a treatment you apply BEFORE blight appears - it doesn't treat already infected plants. kitla wrote: My other option is to put them outside but in part buried pots, so I can control their environment a bit. TBH, they would probably do much better in the soil direct than restrict their roots in pots which can weaken them and make them more susceptible to disease. Soil contains lots of various minerals that the roots can access naturally. Besides, it just gives you more unnecessary work to do! Planting in pots will not prevent blight - the spores land on the leaves rather than infect via the roots. kitla wrote: I read somewhere it also suppresses bind weed & potato worm. Not sure about the bindweed theory (my plot was covered in it and it still grew rampart lol) but yes, french marilds/tagetes are supposed to repel nematodes. On that note, it is probably better to heavily grow the marigolds in a bed before planting potatoes .... the amount of natural repellent tends to be restricted to the marigolds roots so any nematodes already in the ground would simply migrate towards the potato plants anyway. Well my outdoor tomato & cucumber patch has done pretty well. The basil I planted around them grew really well until the tagetes took off & swamped them, no basil left now, but no diseases & no flies on the tomatoes - & as a bonus they look very pretty! No such luck with my r/beans this year, I planted nasturtiums with them to keep off the blackfly, but beans are covered with blackfly & nasturtiums have gone crispy! The upside is the chickens have loved the black fly and nastursiums, so not too bad. I am just about to put some runner beans in, didn't grow from seed, so will see how they go. I have grown toms in the ground before and had good and bad results. Interestingly I have a few tomato plants growing wild in my garden. When I had my chickens I often cut a tomato in half as they loved the seeds. These plants must be from when I had Rosie so a lovely reminder and hopefully they will fruit as they look very healthy. I've got tomatoes growing all over my garden from the chickens 'output' shall we say. There were even a few in their run but they've nibbled them and they are just stalks now. We even had 5 or so plants growing in our laneway, where the soil gathers on the drain (from when we clean the patio off) so I've rescued them and they are in a pot now. We'll see what they do. If only they could poo a variety of flower, fruit & veg seeds, that would be great! kitla wrote: Well my outdoor tomato & cucumber patch has done pretty well. The basil I planted around them grew really well until the tagetes took off & swamped them, no basil left now, but no diseases & no flies on the tomatoes - & as a bonus they look very pretty! It's been an exceptional year in the garden so not typical by UK standards - the leaves on my pear trees for example are usually covered in rust by now but the long hot & dry weather has meant the trees are still green instead of the usual mottled orange! Even the apple trees seem to be faring better too except for too many unripe apples dropping. LL I think I planted too many nastitiums in the beans & they attracted extra blackfly! Oh well, at least we had lots more peas than usual this year. Karen I like the idea - dried chicken poop nuggets with mystery seed packages!